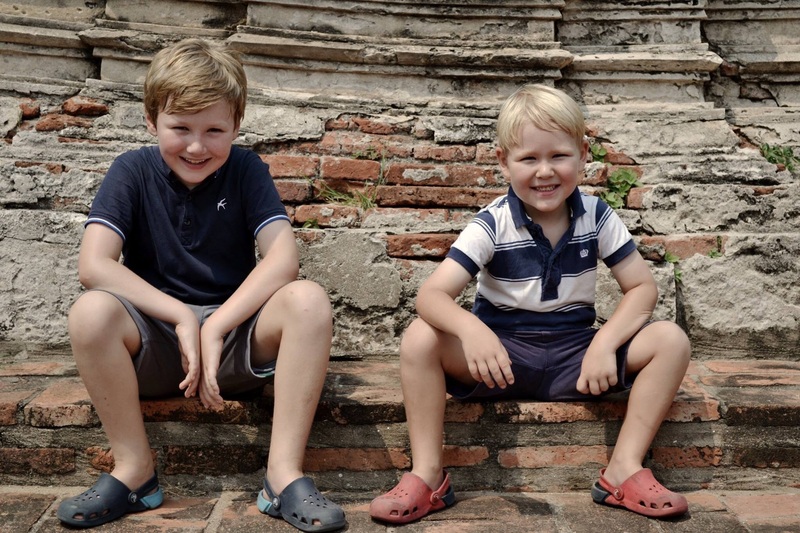 A day exploring the ancient ruins at Ayuthaya. Not exactly National Trust but days off are still fun! Dear Friends, we write at the mid-point of our first year here in Bangkok! We’re told six months is a normal adjustment period for a significant life change like moving… so it seems a good time to reflect and to plan ahead! Day to day the language, the heat and the traffic are still frustrating but when we look at the progress made over six months it puts things in a different perspective! Today we both passed our end of module test for Thai writing – one of us made seven mistakes and one only four (not that we’re competitive at all!) But only one of us was stupid enough to try driving the motorbike through a flood so we’re equal! We’d like to share a few significant moments from the last month before giving you some idea about the next half of our year. 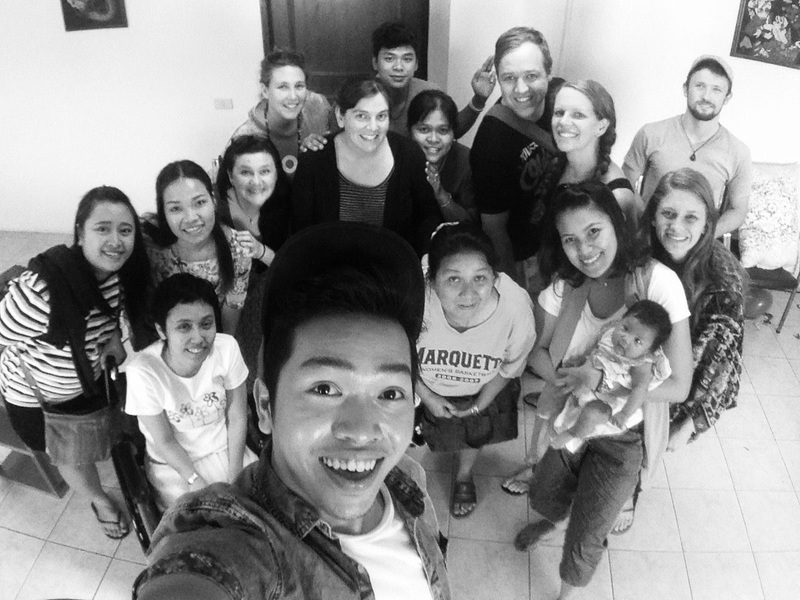 – A weekend away with the Thai leaders from each of the UNOH Bangkok projects. This was about 15 of us all at different ages, backgrounds, stages of our journey with Jesus. We took away an exciting sense of unity; we are all on the same page when it comes to seeing our neighbourhoods transformed! The UNOH regional director from New Zealand, Dave Tims, came along to coach us through the concept of neighbourhood mapping; knowing the history, the socio-economic structure and the resources present in our communities. – Joining in the wedding celebrations of two fifteen year old neighbours. It was an unofficial blessing taking place at home involving lots of friends and lots of food. 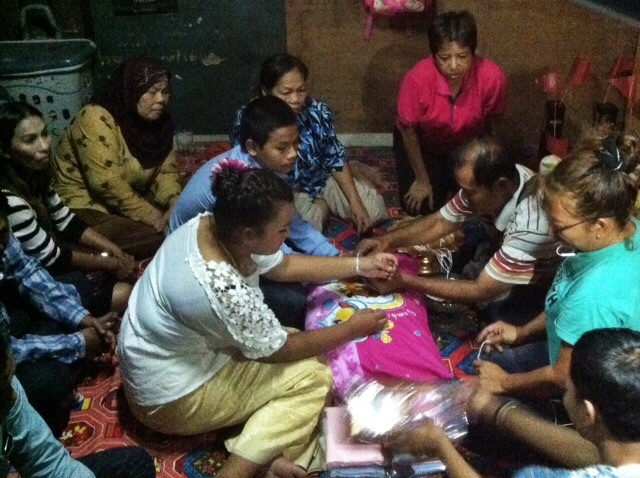 We were fascinated to see the rituals but also to see the value placed on this young relationship. Whatever our reservations, it made us realise how casually our home culture treats teenage relationships, and we could wholeheartedly pray blessing over their future together. The same night we met a neighbour who has just been through the cumpulsory selection process for the army (he picked a red ball from a box which means serving for 2 years). He is gay and faces a really tough time from what we can gather. He was visibly afraid at the prospect and we want to uphold him, and others we know in his position, in prayer for safety and acceptance wherever they are posted . – Last month I wrote about the fight outside our house that led to a new friendship. The same woman later hid out at our home for a longer period when she decided to leave the violent relationship. She was in a pretty hopeless state. It was (and still is) a hard test of our conviction that we shouldn’t solve people’s problems but journey alsongside as friends. 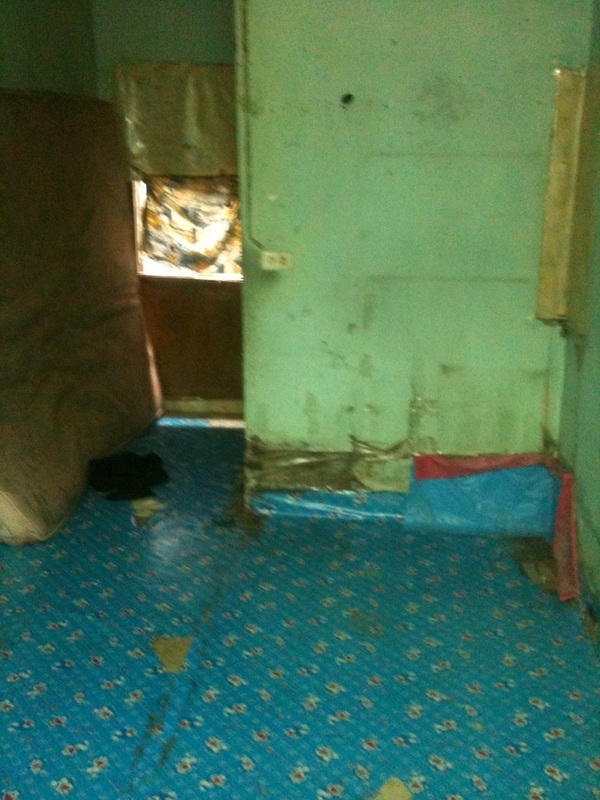 Once she felt safe enough we began to look for a room to rent in a neighbourhood called Rong Moo. 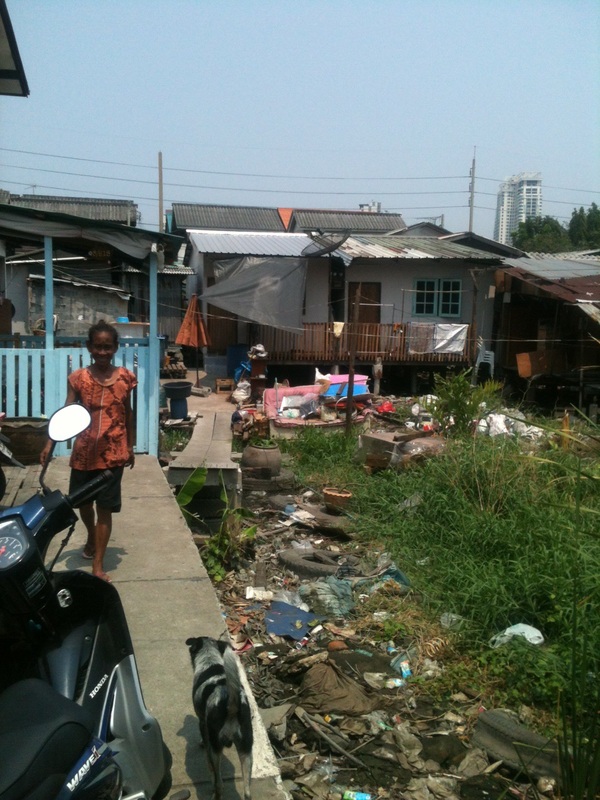 This is a part of Klong Toey slum now disconnected from the rest as a result of eviction and demolition in 2006. Empty places don’t come up often so a room on a £30 monthly budget was a longshot and we knew it. That evening God led us to not one but two vacant homes! Since then we’ve met her a few times on her own turf and she has been excited to show us round the area which is named ‘Rong’ meaning factory and “Moo’ meaning pig. 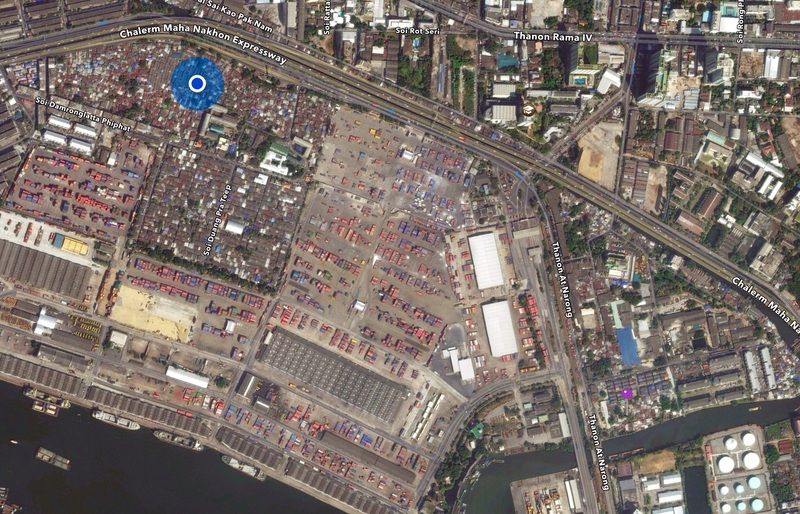 The community is centred around the slaughterhouse which is the end of the road for the pigs of Bangkok! Interesting noises and smells! It is a mix of slum housing and crowded flats giving the feel of a small town brimming with life. Through the cracks we can see it is tough here and our friend doesn’t face an easy future as a single woman attempting to make money to survive. We know so little of this. God brought this relationship to our lives for a reason. 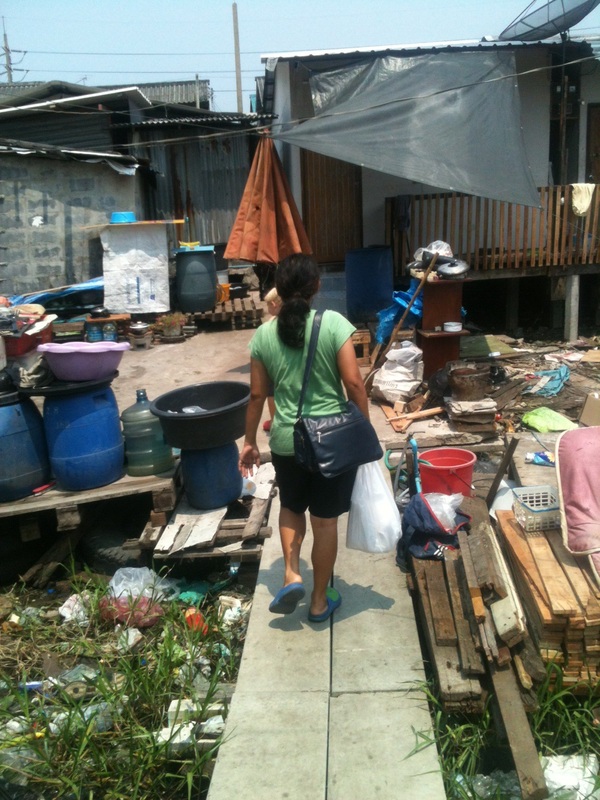 As lots of you know we are discerning a move into a new part of Klong Toey slum as part of our team vision to spread out and form new relationships. Rong Moo had been suggested to us but we wouldn’t have gone out of our way to look for houses there. In fact we had been enquiring in a closer neighbourhood for weeks with no leads. And here we find ourselves on this unlikely journey with an unlikely friend beginning to sense that God might be inviting us to join her. We are planning to move into the other house that we found in Rong Moo. It is just one large room with a bathroom but it is in great condition and we think we can add some partitions and make it work for our family. There have been lots of small things to confirm this decision; the woman living in the tiny hut next door has welcomed us beautifully and it turns out she was once part of a UNOH housechurch. There is a ‘health clinic’ of some description a few doors away just beckoning further investigation! The house looks onto a square of swamp/wasteland and we realise how wonderful it will be to look out and see sky! God knows us well! We are super excited to begin researching the neighbourhood further and make plans about how to start out well in a few months time. Please pray that we all have deep peace about this decision. Please pray that Elliot and Sam will continue to be trusting and adaptable and that we will know the hopes and concerns of their hearts. As is often the case when faced with the prospect of change, we are all realising how much we have grown to love the relationships and routines we have here in Lok 3! It is our prayer that God will begin to plant seeds of vision for the ‘Rim Khlong Wat Saphan Community’ in Rong Moo that pull us forward into what he has for us there.